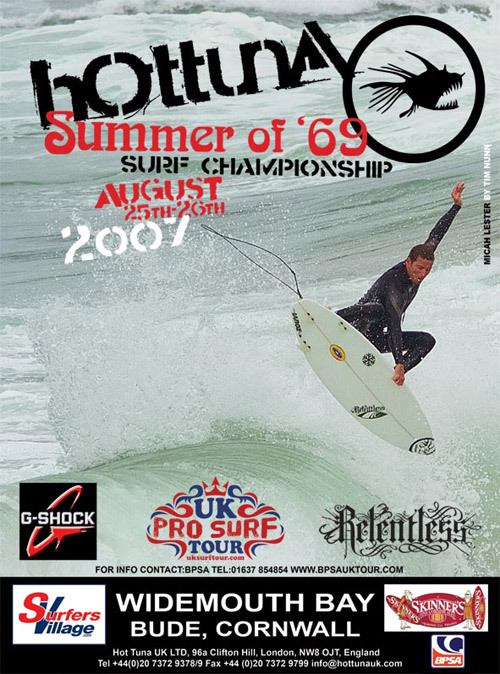 LOWER TRESTLES, California (Monday, Aug. 27, 2007) The Boost Mobile Pro presented by Hurley, the only 2007 Foster’s ASP World Tour event on the U.S. Mainland, brings the planet’s best surfers to the world via a live webcast at www.BoostMobilePro.com. Last year’s Boost Mobile Pro webcast set new standards in live online viewing and in 2007 the webcast experience will be elevated yet again as the World’s top surfers compete for $300,000 in prize money. What a great start to the bank holiday weekend with the third leg of the UK Pro Tour undergone at Widemouth Bay. With excellent summer conditions and small 1-2 ft clean waves the tour riders showed off their incredible talent in what was seen as quite challengeable surfing conditions. With the contest kicking off early doors sat morning and surfers and spectators flooding down Friday night to enjoy the event, the first heat of the day was the groms under 12’s followed by the under16 girls and boys. The u16 boys winner Josh Piper proved himself after a close final between Jack Butler, 2nd, Tom Good, 3rd and Alex Baker, 4th.Local Watergate Bay Boy Piper eventually came to the front after an exceptional surf with dropping conditions he pulled through to take the u16’s title. The last heat of the day was the u16’s girls with Gwen Spurlock once again shocking the crowds with her dominant surfing style hitting her bottom and top turns with force and with style, Gwen caught two good waves early in the heat, Holly tried to catch up but couldn’t quite get there resulting in a win from Gwen. Sunday saw the men’s open heats in the water, starting off with round two of the men’s divisions great surfing was seen by all contenders who were putting all they had into surfing well and seeking to take the title for this event. Mark “Egor” Harris who is currently seeded in first position in ratings surfed well making it through to the semi-finals where he unfortunately was knocked out by “Hot Tuna’s” Micah Lester and Johnny Fryer. Hot tuna team riders Toby Atkins and Micah Lester showed a great performance with Micah throwing his spray all the way to the finals. With an unfortunate lack of waves and loss of momentum, the budding 27 year old found it hard to catch the waves needed to put him in to the leading positions. The Hot Tuna women’s final took to the water also with a fantastic new entry by Dara Penfold from Australia dominating the final, scoring a perfect ten on her last wave. However a fantastic performance was put in by Beth Maison who was the runner up followed by Irelands Easkey Britton and Croyde based surfer Kathleen Spears. “I had a fantastic event and look forward to winning an event tittles on the tour in the future”, Ollie quoted. What a great Bank holiday weekend with Hot Tuna being our main sponsor for this event and our new on going tour sponsors G-Shock, Skinners ale and relentless energy drink providing us with great entertainment, refreshments and food throughout the weekend. Not to forget to mention K38 rescue services that provided safety cover. Jordy Smith wins Sooruz Lacanau Pro 6 star WQS! Jordy Smith (Zaf) won today the first 6 Star WQS event of his career, defeating Spanish Basque surfer Arits Aranburu (Euk) in a 35-minute final, where the two men had to face testing 5 to 7 ft messy waves. Scoring a heat total of over 16 points, Smith was unbeatable throughout the battle, keeping a confident smile on his face while he was running on the beach to paddle back out due to the strong currents. “It’s good to be that close to the Foster’s ASP World Tour, it’s been on my mind and I’ve done it almost. I will still be going for a possible WQS world champion title so I’ll try to keep it away from Tiago Pires (Prt),” said the 19-year-old man with a large smile on his face. 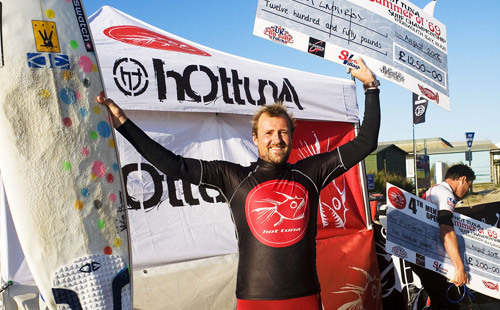 Romain Cloitre wins Rip Curl Pro Junior in France today! Romain Cloitre (REU) has outclassed a quality field of 96 young professional surfers to win the Rip Curl Pro Junior 3 star contest in Seignosse, France today, in great 3-4ft (1-1.5m) waves. Fistral Beach, Newquay, UK: The Men’s Rip Curl Boardmasters 5 star World Qualifying Series (WQS) surfing contest came to a close this afternoon, with former Foster’s ASP World Tour surfer Ben Bourgeois (USA) defeating Brazilian excitement machine Heitor Alves in tricky, 2-3ft (1m) surf. The Rip Curl Boardmasters started one week ago with 168 surfers, but at 4pm today there were only two competitors left standing on the winner’s podium. For Bourgeois, the win launches him to second on the WQS Ratings, just 24 points behind WQS Tour leader Tiago Pires (PRT). “I haven’t won a contest in so long, so just being up there and getting that feeling is so awesome. I’m stoked,” said Bourgeois after the presentation. Bourgeois took control of the 35-minute final from the very start, locking in 5.33 and 7.33-point rides on his first two waves. The North Carolina-born surfer then posted an 8.67 on his fourth wave to cement his spot in first with a two-wave combined score of 16.00 points. Alves fought hard to come back, but the high scoring waves he continually found all week eluded him when the time mattered most this afternoon. The Brazilian’s road to the final was no easy task, facing current WQS No. 3 Jay Thompson (AUS) in the semi-finals and Foster’s ASP World Tour surfer Dayyan Neve (AUS) in the quarter-finals before that. The small, fast conditions were perfectly suited with his radical style though and the goofy-footer overcame both hurdles with ease. The ASP tour caravan stopped at the Grande Plage, Lacanau for this third leg of the European Pro Junior Circuit. Like in the contest before, the surfers had to wait all day for the hoped-for swell which never arrived, forcing the organizers to cancel the contest. The 30 centimetre off-shore waves from the morning didn’t change much by the afternoon, only the wind changed from east to north/north-west, destroying the quality of the waves. Newquay’s Fistral Beach resembled a lake for most of the day yesterday, but action at the Rip Curl Boardmasters was well and truly back on today, with Round 3 of the Men’s 5 star World Qualifying Series event being held in contestable 2-3ft (1m) surf. Retired Foster’s ASP World Tour surfer Jake Paterson (AUS) paddled out in Heat 1, matching up against current Foster’s ASP World Tour No. 23 Adriano De Souza (BRA), Wade Goodall (AUS) and local Mark Harris (GBR). 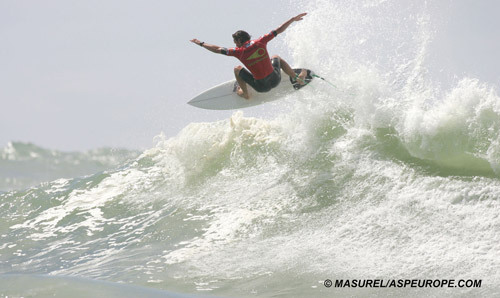 The Brazilian was the standout in the small conditions, but Paterson did enough to secure second and a spot in Round 4.